PORTLAND, MAINE, UNITED STATES, January 9, 2019 /EINPresswire.com/ -- Tea aficionados can start the new year with a constant supply of premium hand-blended teas, curated and packaged by a Maine mother-daughter team. Jacqueline’s Teas is a new online subscription tea service with over 80 varieties of fresh loose-leaf artisan teas sustainably sourced from around the world and delivered by mail each month: www.JacquelinesTeas.com. 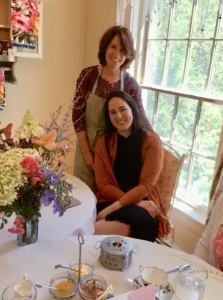 Jacqueline and Barbara have designed five subscription tea offerings that capture the Tea Room’s greatest qualities: unique loose-leaf tea blends, a curated menu, delectable treats, an elegant ambiance, and lessons about tea. The Tea Sommelier Subscription is designed to educate tea lovers about the different genres of tea; the Jacqueline's Teas Subscription features seasonal tea blends paired with Jacqueline’s most popular recipes; and the Black Tea, Light Tea, and Caffeine-Free tea subscriptions can be customized according to flavor preferences. Developed based on interviews with dozens of Tea Room customers, these subscriptions are designed to give recipients an opportunity to experience Maine hospitality from home while seeped in the calming tradition of tea. Subscribers will have access to an exclusive catalog of over 80 bespoke teas. Jacqueline’s flavored and unflavored varieties include a well balanced collection of white, green, oolong, black, rooibos, tisane, and herbal teas which are only available at the JacquelinesTeas.com website. Please contact Barbara Soley with any questions: bsoley@JacquelinesTeas.com or 207-618-8898.